A mare was stranded and alone in the Bridger-Tenton National Forest in Wyoming. She was lost at the lower end of Fish Tail creek and was first spotted by a trail groomer in mid-December. She had been pawing down the drifts trying to eat whatever grass she could find. The groomer contacted the Shoshone National Forest’s Wind River ranger station and they soon found out the horse belonged to an outfitter who had been leading pack trips in the area throughout the fall. U.S. Forest Service Law Enforcement Officer Dirk Chalfant said, What he discovered was a mare who had been stranded for six weeks. There was about 5 feet of snow for at least 3 of those weeks. Valentine, a six-year-old mare, had been left in the forest after falling so ill during a hunting trip that she couldn’t pack out, said BJ Hill, owner and operator of Swift Creek Outfitters and Tenton Horseback Adventures. Chalfant, Hill and Hill’s son, Heith made up the three-person search party. It had been six days since the mare’s sighting when the team headed out. The trails were ungroomed, the snow was falling and getting to the mare was no easy task. Heith was the first person to get some hay to the mare. The snow was falling at a rate of about 8 inches per day and the men tried to make a path for the mare to get out. 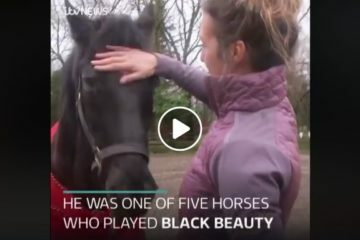 They heard a buzzing sound below them, it was the same trail groomer who had noticed the horse the week before while out grooming. He created an initial path out and the men worked on building a road to lead the mare out. They ponied her out by a rope behind their snowmobiles. 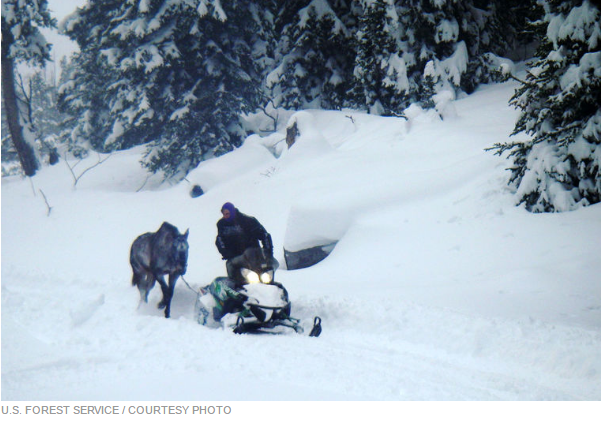 Chalfant raced his snowmobile ahead of them moving back and forth to pack down the snow so the mare could walk out. Source, jbnewsandguide.com. They ended up ponying Valentine an estimated 20 miles before loading her up in the trailer and taking her home. She has so much heart and a will to live. Share this on Facebook if you agree! 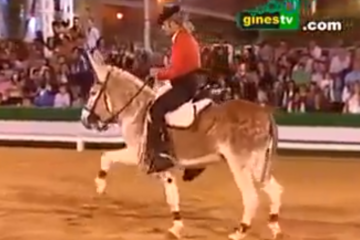 Donkey Dressage Is Pretty Awesome! 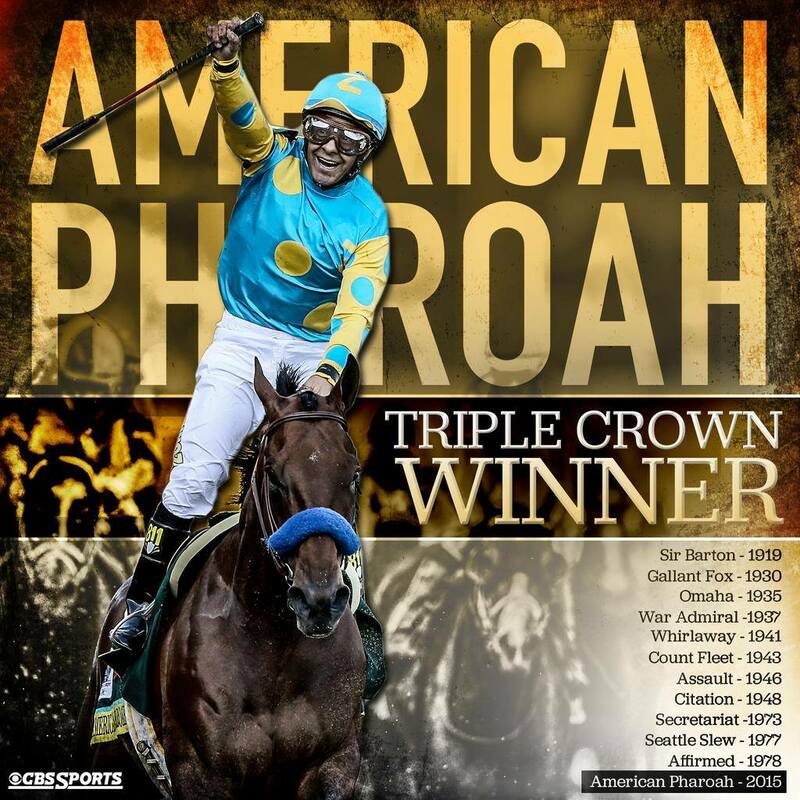 Bob Baffert and Victor Espinoza Are Donating Winnings From The Belmont Stakes To Charity!!! 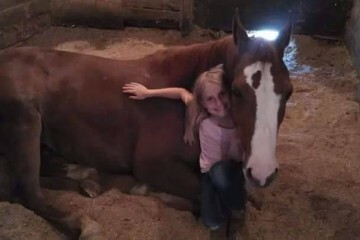 8 Year Old Girls Sick Horse Is At OSU Equine Hospital, Please Help If You Can! Why couldn’t her owners gone to get her before? They knew where they had left her!! They had just left the poor girl there to die but their plans were ruined by the groomer that found her. She should be taken away from them and adopted by someone who will love her. I agree, very typical…. the mare should be rehomed. I completely agree, Linda. I wish the article had expounded on her current condition. Let’s get to the real story – the cruelty involved in this case. Both Dirk Chalfant and Valentine are heroes in my book. But the animal cruelty law in Wyoming has been violated, and the outfitter, BJ Hill, should be fined and lose his outfitter license. 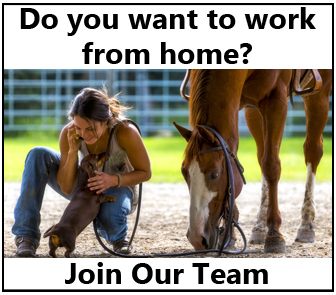 This outfitter should not own or care for any horses and this girl needs a loving home. The jerk shouldn’t get her back! EVER!